Do you prefer a relaxing soak or an invigorating shower? More and more homeowners are saying yes to both. We are noticing that especially in prime properties people are looking for the flexibility of having a separate bathtub and shower area available to them in the same room. This demand also reflects the growing Japanese-style bathing trend of showering to clean your body first, then stepping into the bathtub straight afterwards to relax and unwind. 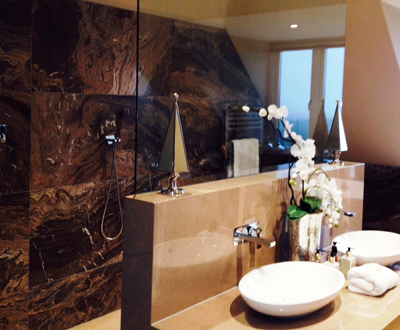 In the UK bathrooms can be small, but this doesn’t mean you can’t have the bathroom features you’ve always dreamed of. Showerpower’s specialist design expertise and made to measure glass shower or bath screens make it possible to incorporate a bathtub and separate shower in all kinds of spaces. One creative space-saving solution is to use a bespoke interior glass wall to accommodate two bathroom features, such as a tub, shower or vanity unit. 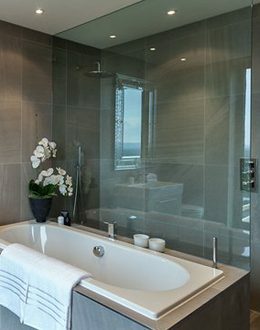 As you can see in this example the glass panel of the walk-in shower forms the back wall of the bath. This clever configuration gives the room a spa-like look and feel. It also makes better use of the floor space and adds privacy to the shower without losing the frameless, open, modern style. Quality materials along with accurate measurement and fitting are the key to success, and Showerpower frameless glass designs are made to measure from 10mm or 8mm toughened safety glass. 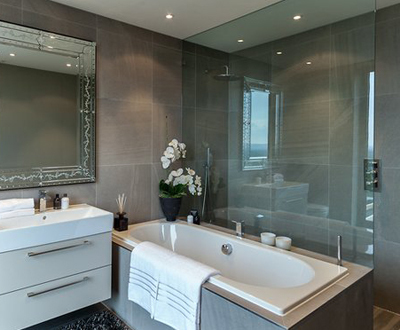 Want to install a bath and shower in your bathroom? Then contact us by email or call us on 01403 829020. 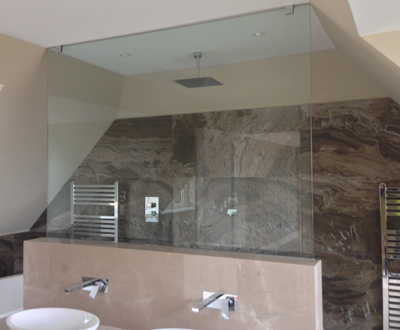 At Showerpower we specialise in creating stunning bespoke frameless glass enclosures and screens for bathrooms in Surrey, Sussex and across the south east of England. Find out more here.